With a population of 127,359, it has earned sixth place among Colorado’s most populous cities. Thornton has come a long way since the fifties, moving away from farmlands and diversifying to all sorts of industries, such as the construction to as advanced as the scientific and technical advancements. It is a wonderful city to live in where there are a very high number of graduation and literacy rates while unemployment is kept to a minimum. Thornton has some of the most well-known state of the art recreation centers, namely Larkridge Mall, Thornton Town Center, etc. It’s also the proud home of the brilliant player Todd Helton. With most of the population with the average age in their mid 30s, it is not surprising why this huge city needs emergency dentists. In fact, what most people don’t know is that you should do a regular checkup every 6 months, but who does that? This, in turn, can create sudden dental problems that may require immediate attention. Lucky for you, this great city is home to many of these hard working professionals at your service. If someone is not accustomed to regular dental checkups, then it is very likely that they may suffer from hidden dental problems getting aggravated with time. Suddenly, you find yourself in agonizing pain. Toothache is no laughing matter; whether it is a sharp pain that is intermittent or an agonizing one that swells your face – all of them require immediate attention. There may be a hidden infection or damage to the blood vessels connecting to your teeth. The fact of the matter is, the earlier it is caught, the less pain you would have to endure. Some people even make the mistake of remedying it themselves, however, you could go very wrong and worsen the situation; and so, it is best left for the professionals. 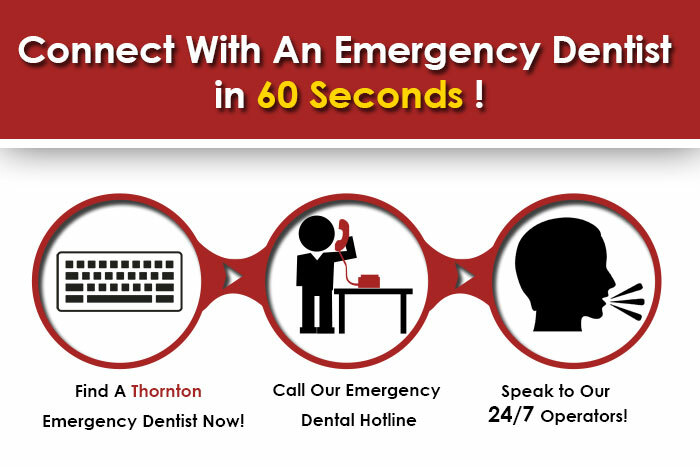 Anything can happen in the unlikeliest times, whether it is a sharp pain at 5am in the morning or your crown suddenly falling off in the middle of your dinner; emergency dentists are the good Samaritans who are always ready to help. Thornton or give them a ring on 303-428-6367. As the name suggests, they are here to brighten up your day by brightening up your smile. They are highly acclaimed professionals and highly recommended by people who visit them. The staff are extremely friendly and for those who are afraid of dentists, this is the place for you! They provide a long list of professional care for your glowing smile. Why not brighten up your day by visiting them at 951 E 120th Ave Thornton or give them a call at this number 303-305-4466.